Copenhagen International Documentary Film Festival has started on March 16, and while there are dozens of screenings every day, one screening on the second day has stood out. „The Sun Also Rises“, a documentary focused on the case of the literary researcher Mette Høeg who openly criticised Danish female authors, had its world premiere at the Cinemateket. Sold out at the premiere, the documentary is likely to add yet another chapter to an already heavily publicised story about the Danish literary and academic worlds and its members speaking out in public. Even after almost two years, the name Mette Høeg still resonates within the Danish media. In the spring of 2015, Høeg, a young literary researcher and a PhD student at The University of Copenhagen, has published an essay in the book section of Weekendavisen where she heavily criticised Danish female authors and the literary world in general. Høeg claimed that current Danish literature is written by women who “grumpily and aggressively play out predictable politically correct, boring, queer, gender, anti-racist and feminist viewpoints”. She also accused the Danish literary sphere of favouring women. “Both the highest positioned women and men who have the power to make decisions in literary institutions get something out of favouring women: The women get the firewood to stoke their own fiery brand of feminism, while the men get an extended interface with author-aspiring, admiring and sexually mature girls,“ wrote Høeg. The essay instantly provoked a fierce debate and both Høeg’s claims and personality were subjected to intense scrutiny. „Høeg and the Weekendavisen newspaper set off one of the most intense literary debates in Denmark over the last 10 years,“ says Christoffer Zieler, a journalist from The University Post, a paper produced by The University of Copenhagen. The case was publicised so much that Høeg was even offered a job – to have her own radio literature show at the station Radio24syv. Høeg accepted the job. But the controversy surrounding her did not stop there. At that time, the researcher was amidst writing her dissertation and finishing her PhD studies. But after publishing the essay in Weekendavisen and starting hosting her radio show, Høeg noticed a change of approach from her PhD supervisor at the university regarding her work on the dissertation. The tension between Høeg and the faculty’s senior academicians resulted in Høeg having to undergo a recovery conversation – a proces in which a university offers a PhD student three months to get their PhD programme back on track. This is the documentary’s entry point. 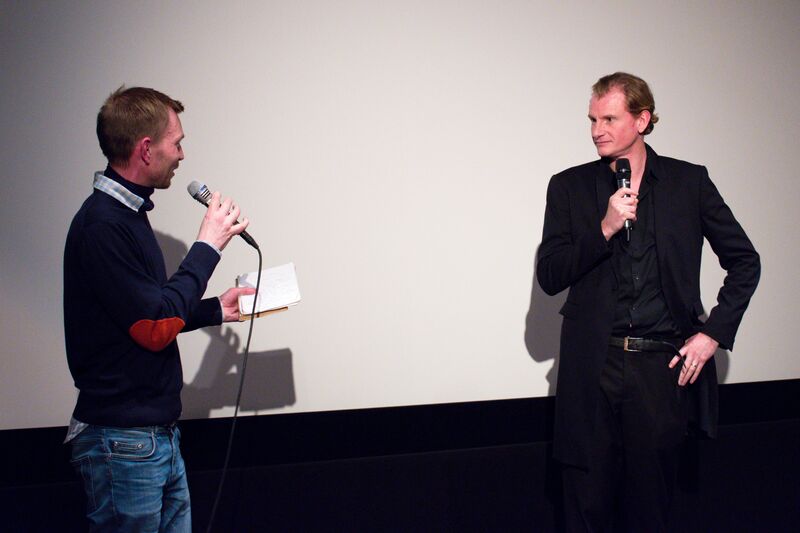 Director of “The Sun Also Rises” Thomas Altheimer talking about his documentary at the world premiere at Cinemateket. The film, directed by Mette Høeg’s husband Thomas Altheimer, offers a very personal perspective on the literary researcher and her thought process dealing with a puzzling conflict between her and the university, ultimately resulting in Høeg departing from the institution and leaving her PhD studies there unfinished. Paradoxically, the documentary could end up being another chapter in a story that it itself depicts, as its most intense and intriguing part shows a part of the recovery conversation that led to Høeg’s quitting the university. Whether the premiere will stir more debate on the power structures in the academic world and one’s ability to operate within them is then a question that should be answered fairly soon. Until then, CPH:DOX plans to show the documentary three more times. The places and times of the screenings can be found on the map below.